Booker T. Washington once said that “You measure the size of the accomplishment by the obstacles you have to overcome to reach your goals.” This quote matches up profoundly with the date August 28th. To some, the day August 28th maybe a birthday, or just a simple beach day, but the significance this day holds is truly immaculate. 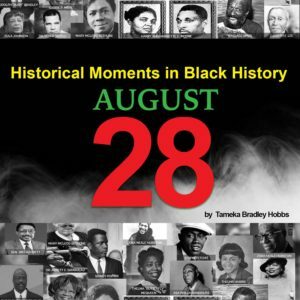 August 28th holds a great significance in the black community, as it continues to be a day of change and fruition. Most recently on August 28th of 2016, after years of hardship and brutality, The National Black History Museum was opened. This exhibition is located in Alexandria, Virginia and its creation has been in the works for what seems like a hundred years. In the early 1900s, a group of Civil War veterans campaigned for a national African American history museum. This evident gap in the idea and actual construction reflects the African American struggle and the notion that nothing has been easy, but everything has been earned. This struggle was evident throughout the process, specifically with funding. The exhibition would cost $540 million, with the federal government willing to only pay half. It is notable that through adversity comes triumph, as the community banned together with both the Oprah Winfrey Charitable Foundation and the Melinda & Bill Gates Foundation contributing millions to the project. Another black man would come to change history in Washington, as a mere forty- five years later, the first black man would obtain the nomination for the Democratic party president on the same day of August 28th in 2008. This man, Barack Obama, stated that, “Each and every time, a new generation has risen up and done what’s needed to be done,” he said. “Today we are called once more, and it is time for our generation to answer that call.” Mr. Obama would then go on to win the presidential race and become the first black president, while serving for two whole terms. 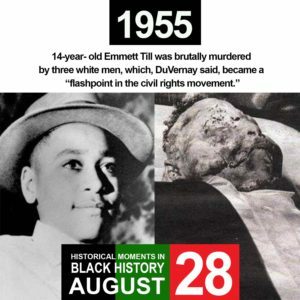 Even though August 28th maybe be seen as a day of fruition for some in the black community, it may be seen as a day of loss for the community as well. On the 23rd of August in 2005, the hurricane began to form over the Bahamas, with meteorologists warning the storm would be a category 3 hurricane, but it would eventually end up being a category 5 storm. 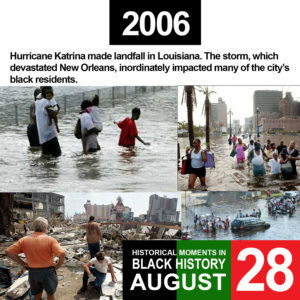 The effects of the storm were also noticeably exacerbated in New Orleans specifically, as the average elevation is around six feet below sea level and during the time around 67% of the population was black, while 30% of the population lived in poverty, according to the data center.